New group photo albums and mobile app for the iPhone allow users to collect the best photos from a party or event. The new Kodak Gallery app lets users create ad hoc social networks to share their photos. So if you're watching your kid play soccer, for example, you can create a network on the spot among the other parents snapping pics with their iPhones. They'll get an invitation to join that specific network and upload their photos to the service as well. KODAK Gallery (http://www.kodakgallery.com), the only online photo service uniquely designed for celebrating KODAK MOMENTS together, is changing the way people share photos with the launch of Group Albums. Group photo sharing is easier than ever. Multiple people can now upload, share and comment on photos all in one place, for free. The company has also announced a new version of the KODAK Gallery app for the iPhone devices. Using the app on the device makes it the easiest way for a group of friends to collect and share all the photos they take together at party or on a trip. Whether the pictures are on a mobile phone or digital camera, they can be shared and saved in one convenient place. With Group Albums, a group of friends can easily collect, share, and interact with every moment they capture together by camera at a party or on a trip by starting a Group Album at kodakgallery.com/groupalbum. Simply collect, share and invite others from the event to contribute their own photos to the Group Album. All photos can be downloaded in full-resolution online for free, can be used to create a video slideshow of the event or turned into photo products such as books and calendars. A Group Album can be started online at kodakgallery.com or right from an iPhone using the mobile app. Like all sharing tools at KODAK Gallery, members of the album can privately share pictures and invite others to join and participate by sending an email, text or FACEBOOK message. Once people join the album they can add photos and comments, plus invite others from the event to contribute their pictures. The KODAK Gallery app for iPhone devices allows users to start and participate in a Group Album. In addition, it includes other major feature enhancements such as multi-photo uploads; hundreds of ways to share; access to all pictures and albums in a KODAK Gallery account; and push notifications when photos, comments and “Likes” are added to an album. The app addresses the shifting trends in consumer photo sharing behavior. The number of KODAK Gallery photo slideshows viewed on a mobile phone has increased almost 170% in the last year, and according to a recent survey 65% of 18-34 year-olds plan to take pictures this holiday season using their mobile phones. 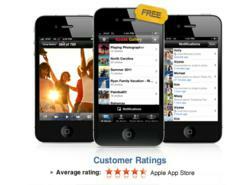 The KODAK Gallery app for the iPhone device is currently available in the App Store and has received a 4 ½ star rating. In the last two weeks, more than half a million photos have been uploaded using this new app. 2011 KODAK and KODAK MOMENTS are trademarks of KODAK.